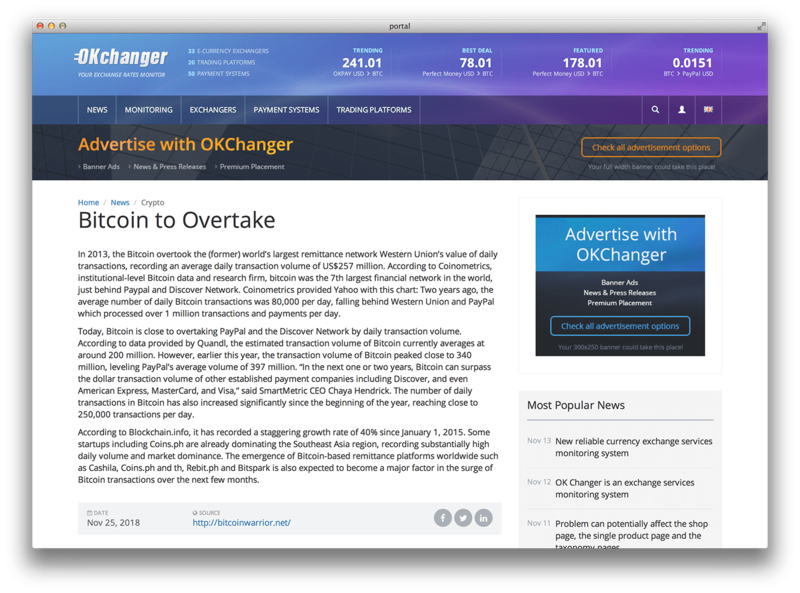 OKchanger is a rapidly developing, one-of-a-kind web portal, and a fusion of current exchange rates of major digital currencies, news and information about all aspects of e-commerce and companies that specialize in the field of e-commerce. 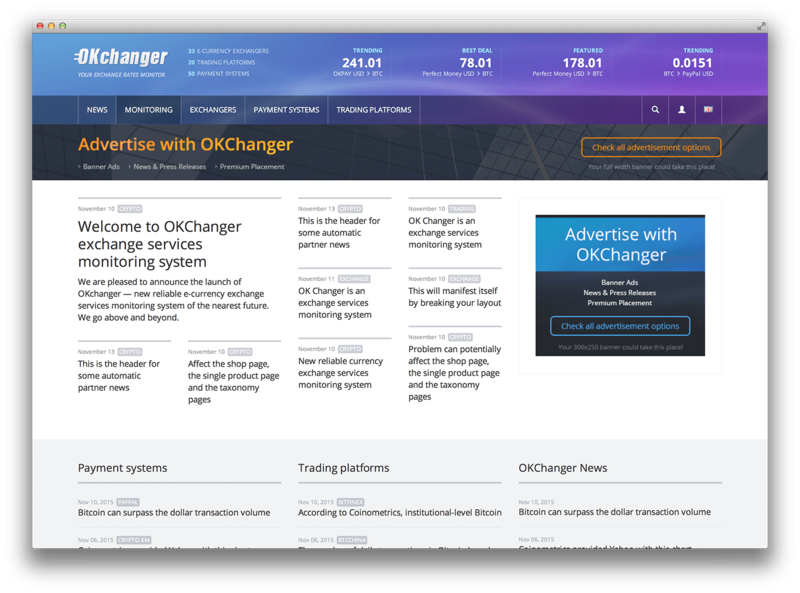 With hundreds of thousands of visits paid by e-currency traders, brokers, owners and users of popular exchanges and various online services, OKchanger offers a unique opportunity to advertise and promote your business to this broad international audience. Being passionate about e-commerce, we strive to be its driving force by letting merchants find their customers and boost sales. 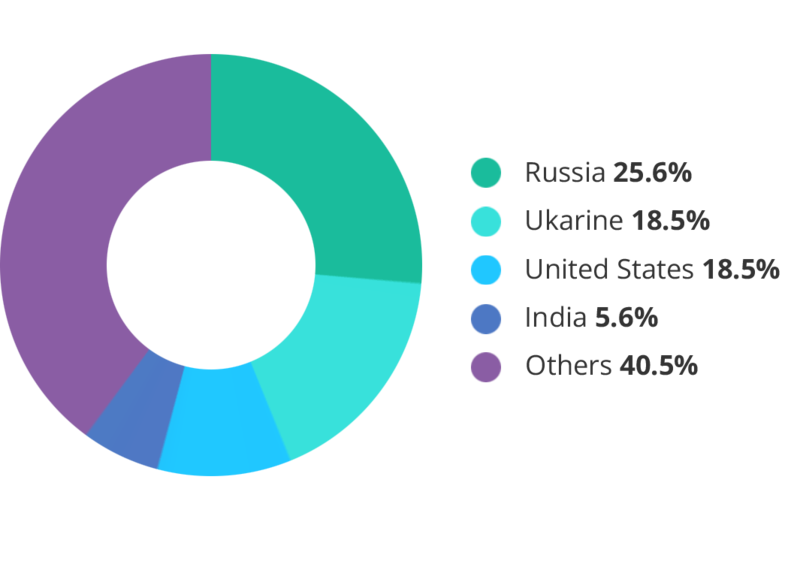 A vast audience comprised of business owners (exchange providers, crypto exchanges, etc.) and target visitors that are ready to become your active customers. A huge and ever-growing library of e-commerce-related information including latest news from markets and exchanges, expert analyses, customer reviews, etc. 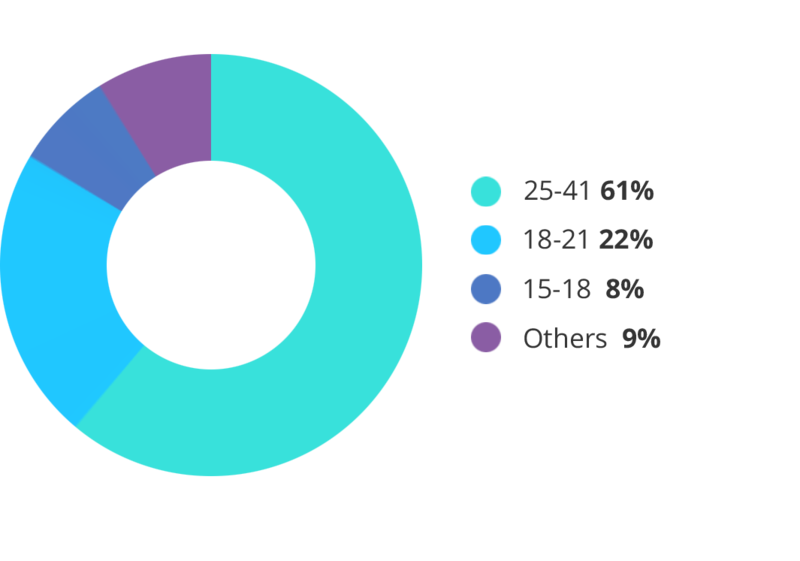 A high level of trust in our service, a fast-growing number of active users, and a high conversion rate that drives visitors into returning customers. For detailed performance tracking and statistics for each option you can use any software or service you want! Only real visitors are counted - we use a special algorithm that prevents click fraud and cuts off fake traffic, so you will get only high quality and relevant traffic to your website. 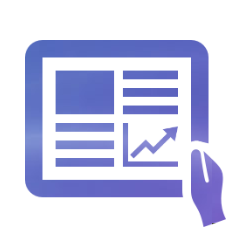 A page-wide banner displayed on each page – is truly the best promotion technique for maximum effect. 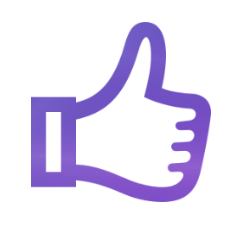 Appears on a specific page of your choice. 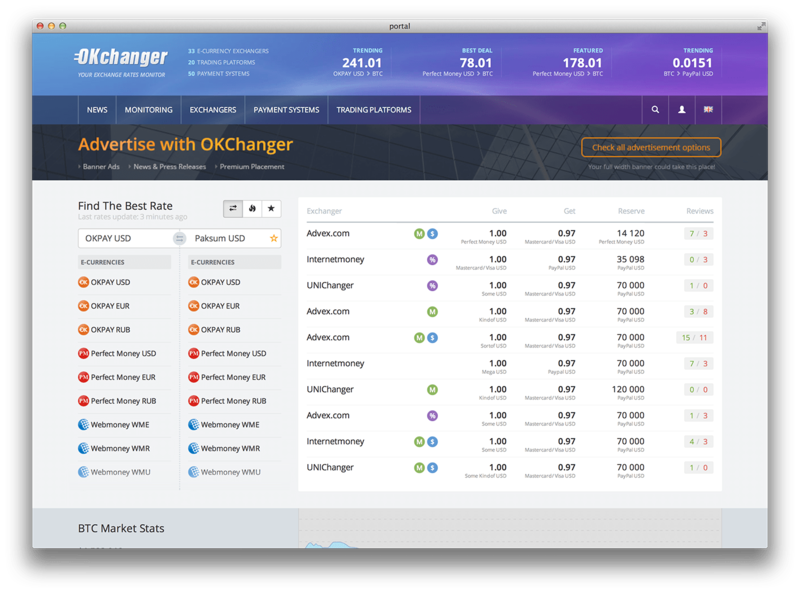 Make your exchanger stand out by buying a Premium Listing Placement in our Monitor. Premium Placement means that your service will be highlighted in our Catalog for automatically attracting the attention of potential customers. 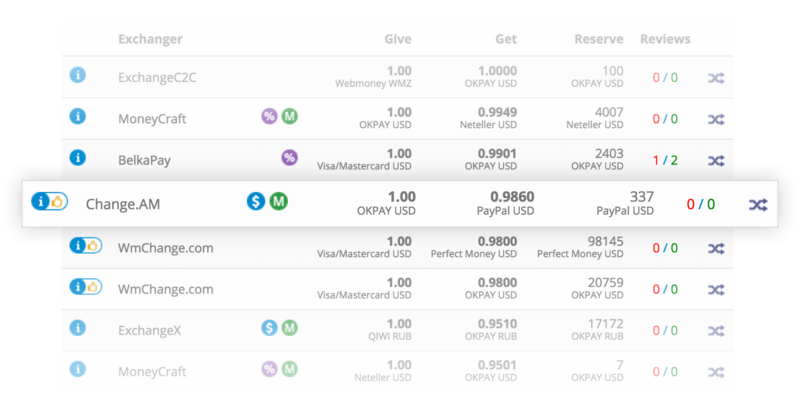 OKchanger is a unique platform that provides highly popular exchange rates monitoring tools and gathers relevant information about all aspects of e-commerce. 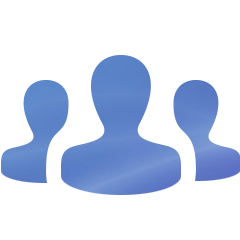 Our users are key market players, payment providers, sole traders and entrepreneurs who have one thing in common: they are a perfect target audience for any serious business that offers e-currency exchange services. Submit an ad request, and we’ll get in touch with you as soon as possible. Please specify what kind of ad you are interested in or ask a question. Our manager will contact you to discuss your goals and help you select the best option so that you could achieve maximum results. I agree with the Advertising Terms and Conditions.